Disney California Adventure looks best after dark. Compared to Disneyland, California Adventure has more outdoor rides that are especially fun at night, and the bright lights at Paradise Pier and in Cars Land make both of them fun to walk through when the sun is down. Throw World of Color to the equation, and it adds up to make it our favorite Disney theme park after dark. You can buy a pair of special Mickey Mouse ears or other products that do more than just glow when you turn them on. Wear them to World of Color, and you'll find they change colors to complement the show. Some rides close early at night, especially in Disneyland, where they have to keep guests safe from fallout during the fireworks shows. During busy times, Buena Vista Street shops may stay open after the rest of the park closes. It sounds like a good time to shop, but it's very crowded then, and you're likely to be tired. You'll be better off to make your purchases during the day. Just ask the store clerk where can park your packages and then pick them up on the way out. And here's a little-known tip: You can get into line at any ride up seconds before closing time, and you will be allowed to stay until your ride is over. It's a good way to get in just one more ride before you have to leave. Make sure you're on time, though. Cast members are very strict about the time and won't let you into line even a minute or two after closing time. It's hard to be too upset about rides closing early when it's all to make sure it's dark and safe for World of Color. Check the Disneyland Resort Calendar to see if and when World of Color happens and expect all the rides in Paradise Pier to close before it starts. That includes the Incredicoaster, Golden Zephyr, King Triton's Carousel, Jumpin' Jellyfish, Mickey's Fun Wheel and Silly Symphony Swings. California Adventure's World of Color is a fun show, featuring dancing fountains, music and clips from all your favorite Disney and Pixar animated features projected onto screens made from mists of water. If you want to see it, use this guide to World of Color to find out how to get passes and preferred seating. In 2018, fans of the Paint the Night parade which ran at Disneyland from 2014 to 2016 were delighted to find that it has returned, this time at Disney California Adventure. Some people call it the spiritual successor to the beloved Main Street Electrical Parade, an updated version that takes full advantage of twenty-first-century technology. Unfortunately, the Disneyland Resort's relationship with this amazing parade is an on again/off again affair. The parade ends its current run on November 4, 2018. Start your night at California Adventure in Hollywood Land. Walk down the street to the end at the Hyperion Theatre, then turn again in front of Guardians of the Galaxy. If you think it looks a little bit like Hollywood Boulevard or a scene from a 1930s movie, you'd be right. The design of the main street in Hollywood Land takes its cues from both. With the spotlights from the music venue shining overhead, it takes on an even more surreal look. Enter Cars Land from the main walkway, where you'll see a big billboard that makes a perfect photo backdrop. The main walking area in Cars Land is called Route 66, named after the iconic U.S. Highway and lined with bright neon lights that rival the real ones that once lit the main drag of many Route 66 towns. With the golden glow on the Radiator Springs landscape at the end of the road, it's as pretty as any picture postcard ever mailed. Wow! The neon at Flo's is literally electric. The colors are great; the lines draw your eyes toward the name - and take a closer look at what's on the right: they're pistons from an automobile engine. Flo isn't the only one sporting neon on Cars Land's Route 66. Take little side trip through the Cozy Cone Motel, inspired by the "Wigwam Motels" along old US Route 66. The orange-colored cones are small food stands selling a variety of "cone-coctions," but don't let the snack food distract you from the cleverly designed lighted flowers made from car tail lights. This road race is taken from Lightning McQueen and Sally Carrera's drive along twisting mountain roads to the vacant Wheel Well Motel. Part of the ride is indoors and in the dark all the time, but part of the track is outside and the red-rock backdrops are even prettier at night. This is one ride we'd do twice, just to enjoy it both ways. Find out all the details and about height restrictions in the Radiator Springs Racers Rider Guide. Those baby tractors look all the cuter at night, don't they? The ride vehicles are lifted off the ground by just a bit of air pressure, and the movement is gentle, giving you some time to look around if you want. If we had to choose, we'd ride this one at night, but it's fun in the day, too - and you only need to do it once. The Junkyard Jamboree Rider Guide has all the details and information about riding it, including height restrictions. Leave Cars Land by walking between Flo's and Radiator Springs Racers, and you'll be in Paradise Pier. Paradise Pier is beautiful at night, with all the lights reflecting on the water's surface, but we chose more a skyline-like look for this photo, showing Arie's Grotto and the roller coaster. 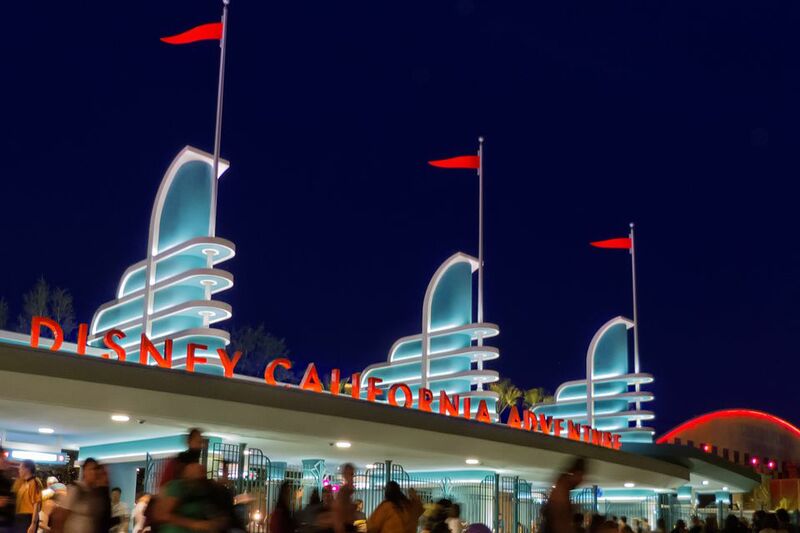 Take a peek at the next few images for more of the reasons we think it's one of California Adventure's best places at night. It looks like a wooden roller coaster, but it actually runs on metal rails, zipping around above Paradise Bay. Keep your eyes open when you do the loop and if you can stop screaming long enough, try to sneak a peek at the rest of the park as you go. The Incredicoaster is different enough that we'd do it in both daylight and at night to enjoy it both ways. Find all you need to know about it, including height restrictions in the Incredicoaster Rider's Guide. If you've seen an oceanside Ferris wheel somewhere else, this one will seem familiar, with the patterns of blinking lights that are so mesmerizing to watch. The twist here is a big, smiling Mickey Mouse face in the middle that makes this unmistakably a Disney attraction. This Ferris wheel takes you higher above the park than any other ride, so it has the best views. For more fun, get into one of the swinging cars, but if you want to take some night photographs, the fixed ones will be more stable. The Fun Wheel is worth two rides, both day and night so you can enjoy the views in a different light. And it's one of the few rides on this list that doesn't have height restrictions, making it a good choice to ride with the kids. The Mickey's Fun Wheel Rider Guide has more information about the types of cars and tips for riding it. Golden Zephyr is a gentle ride, flying in rocket ship-shaped vehicles above Paradise Bay. You'll get some nice views of the park below and all the colorful light reflected in the shiny, metallic ships are pretty, too. The Zephyr is fun both day and night, but if we were only going to ride it once, we'd do it after dark. It's one of the few good night rides that doesn't have a height restriction. If you want to ride, you'll find all the details in the Golden Zephyr Rider's Guide. Jumpin' Jellyfish is a gentle ride that takes you above things, then bounces you back to earth, giving ample time to look around. Besides the nice views of the park, the ride itself is colorful, glowing with vibrant colors and it's great to look at even if you don't ride it. If you're riding with kids, the jellyfish may be better in the day, but we'd do it just once at night because it's so much prettier. Take a look at it during the day - and get all the info you need in the Jumpin' Jellyfish Rider's Guide, including height restrictions. Lots of Paradise Pier rides take you around in circles, including the Silly Symphony Swings. Sitting in individual seats that feel a little like the playground swings from your childhood, you'll go flying out above Paradise Bay and have a chance to see lots of the park all lighted up. If you're only going to ride it once, do Silly Symphony Swings after dark. All the details about this ride, including height restrictions, are in the Silly Symphony Swings Rider Guide. Goofy's Sky School is a so-called "mad mouse" roller coaster, with small cars that are wider than the track and ride on top of it. It takes tight, flat turns that make you feel like you're going to go straight ahead and plunge right off the rails - until the last minute. All of that feeling is even more fun in the dark, and so are the abrupt "bunny hop" drops. This ride may be slightly more fun at night than in the day, but if you have time, do it twice to enjoy the differences. All the ins and outs (and ups and downs) and height restrictions are in the Goofy's Sky School Rider's Guide. Explore All the Fun You Can Have at Disney California Adventure!